As the year 2014 has come to a close, now is a good time to inventory changes in the consumer electronics market and project those trends forward. One of the most obvious changes was that wearable technology has, by my observation, approached the brink of the adoption chasm into the early majority. In this article we will focus on the significant business and consumer factors of wearable technology, the notable introductions in 2014, as well as future AnandTech coverage. If you are unfamiliar with ‘the chasm’, this is a reference to an acclaimed technology marketing book by Geoffrey A. Moore in 1991. As seen in the figure below, Geoffrey describes five stages of adoption. The first, consumers described as innovators, are on the very bleeding edge. Innovators have a combination of unique interest in the subject area and abundant disposable income. There is a small chasm between this group and the next. This small chasm has killed many technologies and you could probably argue that 3D TVs died here. Next, early adopters are more like typical AnandTech readers. These consumers are technologically savvy and often the technology go-to person for groups of family and friends. Early adopters are likely to have made investments into products that their friends have yet to invest in themselves. My wife described me this way when I made the jump from iPhone to Windows Phone. It was an early product without majority adoption (and still is), but I wanted it anyway. This brings us to The Big Scary Chasm in Question. How does a technology explode from a “hobby”, as famously Apple described its Apple TV, to a staple like the iPhone? 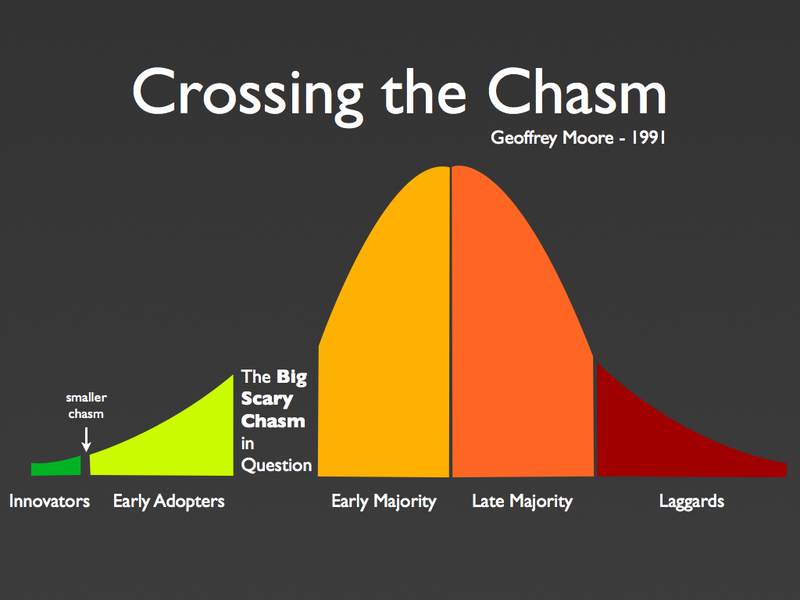 In the information age of today, crossing this chasm is primarily a focus of marketing. Sure, you need good product, but without effective marketing there is little chance of wide adoption. There are plenty examples of products that have been favorably reviewed by AnandTech and others but didn't see widespread adoption. Often, it's a case of competing against the marketing budget of a much larger company, but that's a topic for another day. In short, going from a cult hit to a market leader is difficult; hence, the Chasm. Taking this back to wearables, 2014 saw the most marketing of wearables yet, and for good reason. The traditionally explosive smartphone and tablet markets are slowing down. Analysts at CCS Insight projected a fall of smartphone sales' yearly growth from 40% in 2013 to 25% in 2014 and 15% in 2015. Analysts at Gartner project a fall of tablet sales' yearly growth from 55% in 2013 to 11% in 2014. IDC projects 2014 tablet growth even worse at 7%. At the same time, wearable revenue is projected to dramatically grow. ABI Research projects wearable technology at a compound annual growth rate (CAGR) of 56.1% over the next five years. Finally, Price Waterhouse Coopers’ interview samples show that 76% of consumers do not need a new wearable device to replace functionality of an existing device. The top consumer eco system players – Apple, Microsoft, Google, and Google’s partners – are growth companies. Continually increasing revenue is a corporate foundation. Without revenue growth, careers stagnate as no promotions or raises are possible. Go long enough without growth and your top talent can leave for a company with growth opportunity. In Samsung’s recent 3rd Quarter financial results, their revenue fell 20% year over year and Samsung primarily attributed this to smartphone struggles. With all this data combined, it is a no-brainer for these consumer companies to shift resources to wearables. Therefore, all have made significant wearable announcements. Google’s partners and Microsoft have launched devices while Apple is alone in the laggard position of having nothing on the market (with Apple Watch coming this year). At their core, wearables are of course technological devices that you wear. In some sense, your smartphone is actually a wearable. Even though a smartphone usually does not directly contact your body, it is a wearable just as much as a smart purse or backpack is a wearable. However, as smartphones are already a category of their own, they are traditionally excluded even though the core technology is vastly similar. That core technology consists of sensors, wireless, storage and computing. 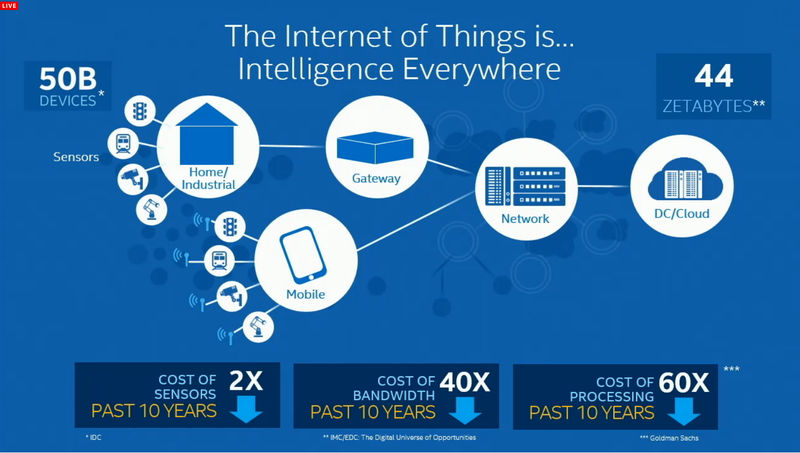 Intel’s recent IoT (Internet of Things) platform launch contained a slide detailing the cost reduction of some of these components, which is an enabling factor of wearable growth. Where wearables differ from smartphones is their function. By breaking from the traditional smartphone form factor a wearable can provide different benefits. These benefits can be broken down into different categories that closely mirror the contents of the device as different sensors, processors, wireless, and storage enable different use cases. On the left side of the above diagram from ARM are devices that contain wireless connectivity, sensors, a low power microcontroller such as Coretex-M, small amounts of memory and storage; run an embedded OS; and potentially have an optional display. The vast majority of these devices today are for fitness and health, however some provide smart watch functionality as well. On the middle and right side of the diagram are devices that integrate higher end processing and storage such as full-blown application processors (think Cortex-A series) and DDR memory. These allow running richer, non-embedded operating systems (such as Android) and higher-end features at the cost of power consumption. Good article on the devices. My one thought running through every page is who still wears a watch? I know a lot of people who do not wear or do not like to wear watches. I can use non-custom in ear headphones for more than an hour without ache, it's highly subjective, tho also highly dependent on the design and tips used (and IEM usually have a far wider variety of that than BT devices). Agree. An in ear that isn't a pain in the @ss. I can do less than an hour. I'm not a fan of cables and charging an in ear too. I have a Plantronics over the ear hands free headset at work that has a portion that goes in the ear and I can leave it in all day. I have almost left the building with it on. But, I leave it at work and am happy to do so. People are discussing wearables and are blindly talking about "finding the next big thing" without catching statements like yours. Hearing aids require special fitting. They're expensive. They're also medical devices. Custom fit is ultimately the best solution, and it doesn't have to be that expensive... Used to be you needed to drop a grand for any decent CIEM, whereas you cab get them for under $400 these days. Bragi Dash (http://bragi.com) is most of the way there. In-ear wireless speakers with a bunch of sensors that connects to your phone over Bluetooth. It uses a bone-conduction mic, though, so it wouldn't work for your real-time translation scenario. A clever app dev, though, could probably come up with a way to use the phone's mic for that. Place the phone on the table between you, stick an ear bud in, and start talking ... the phone translates and plays it back through the ear bud. They also have support for notifications and whatnot. And Google Now running through it covers a lot of ground. For the last fifteen years, I've only worn a watch when dressing up a bit for social occasions etc... But even the basic out-of-the-box functionality of the 360 lured me to wear one on a daily basis again and I really like it. Heck, I even kinda like not having to dig my phone out to tell time... The overall package is definitely a luxury convenience, I could live without it for sure, but it makes certain busy days a whole lot easier.